February’s Last Hurrah! Both Little Sisters Are Sold… Thank you! This month’s offerings… Lizzybit on the left and Izzybelle on the right. Plus a long sleeved red dress sized to fit one of the girls larger 18-19 inch sisters. For February’s (snow delayed) Third Thursday I have two one small little Izzy’s who are looking for loving homes ❤ The larger doll is made from my mold of the antique Lizzybit. She is 16 inches tall. Her smaller companion is 14.5 inch tall Izzybelle. The dolls and extra dress are offered for sale on a first come basis. The way it works is simple. 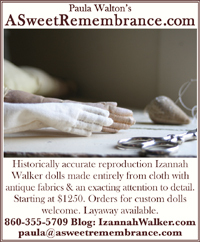 If you would like to purchase one of the dolls, or the dress, email me at paula@asweetremembrance.com. I’ll go by the time stamp when I receive your email to determine whose request is first. 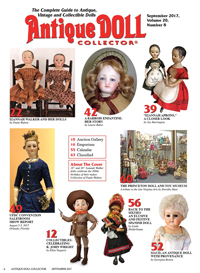 The dolls are $1250.00 each, and the dress is $225.00, which includes free shipping to any address in the continental U.S. Dolls are mailed via USPS Priority Mail and are insured for their full value. International Orders will be charged exact postage + a $10.00 handling fee for all international locations, except Canada, to help off-set the time it takes me to deal with customs forms – and in many cases the requirement that I actually take the package to the post office rather than scheduling it for pick-up. Payment may be made via PayPal, credit card, personal check, or lay-away. Sales tax is 6.35% if I am shipping to a Connecticut address. 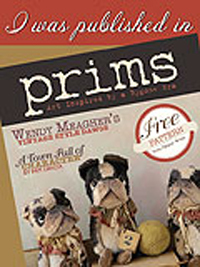 All items sold on a “first come” basis. Email me at p.walton.asweetremembrance@gmail.com to purchase. Paypal, credit cards, checks or money orders accepted for payment. Lay-away may also be arranged. 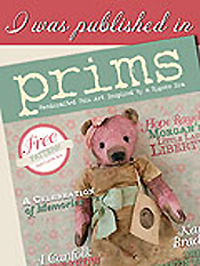 Free priority mail shipping & full insurance to any U.S address. International orders ~ exact postage + $10 handling fee to help off set the extra time required for international shipping. No handling fee for Canada. ❤ At the current time I am not accepting any more custom orders. Once I manage to work through my backlog, I’ll start taking orders again ❤ If you have a particular doll or dress on your “wish list”, comment below. I’ll take “wishes” into consideration when making items for future Third Thursdays! 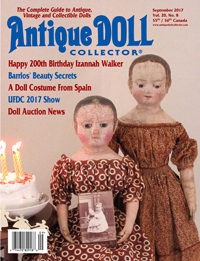 18 inch Isabeau with Bare Feet – SOLD $1525.00 A sweet, timeworn reproduction of the original “Isabeau”, wearing a long sleeved dress made using a pattern from an original Izannah Walker doll dress. Her other clothing is comprised of a linen chemise & petticoat, cotton pantalettes, stockings, handmade leather shoes, and a cotton “coral” print apron. All of the fabrics and buttons in her wardrobe are antique. Pink & Black Print Dress – SOLD $250.00 This dress is lavishly trimmed with rows of black velvet ribbon. It is made from antique mid-19th century fabric and closes in the back with drawstrings. 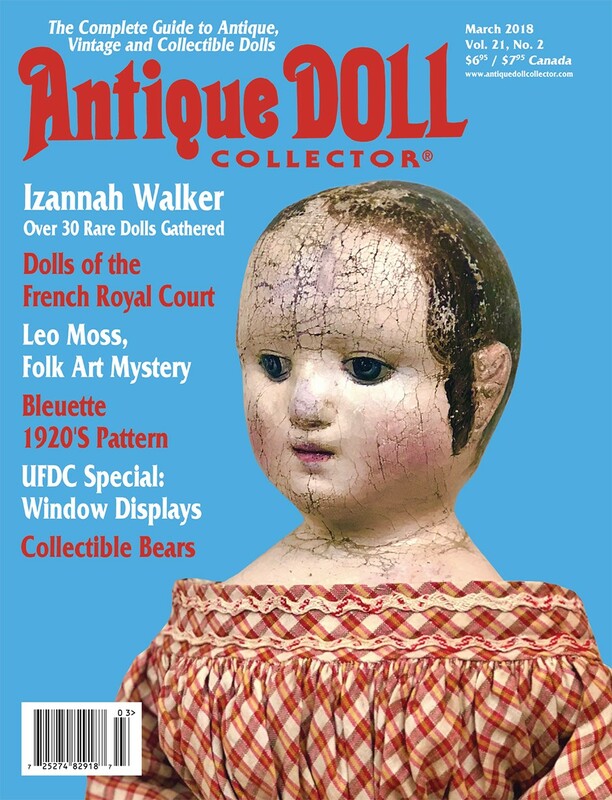 Sized to fit 18 – 19 inch Izannah Walker dolls ~ either the antique originals or my reproductions of them ❤ Skirt length is 8 inches. White Eyelet Dress – SOLD $200.00 Pure white vintage eyelet. A lovely party dress for these last hot days of the year! 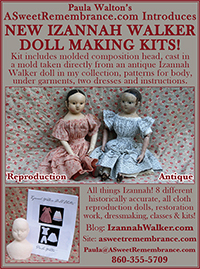 Sized to fit 16 inch Izannah Walker dolls ~ if you have one of my reproduction Annas or Lizzybits this dress will fit them. It would be a bit loose & long on Izzybelle. The dress would also fit an 18 inch doll, if you prefer shorter skirts. Skirt length a scant 7 inches. All items sold on a “first come” basis. Email me at p.walton.asweetremembrance@gmail.com to purchase. Paypal, credit cards, checks or money orders accepted for payment. 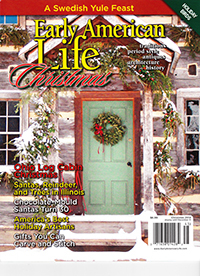 Free priority mail shipping & full insurance to any U.S address. International orders ~ exact postage + $10 handling fee to help off set the extra time required for international shipping. No handling fee for Canada.